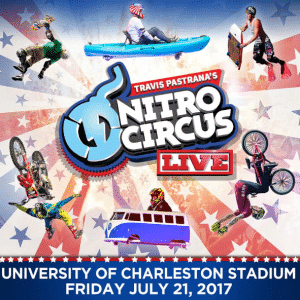 Nitro Circus is coming to Charleston, WV on July 21, 2017 on Laidley Field at University of Charleston Stadium beginning at 7:00 p.m.
From humble beginnings, with Jeremy Rawle, Gregg Godfrey and action sports superstar Travis Pastrana producing DVDs from a garage in Utah in 2003, Nitro Circus has exploded to global popularity, leaving a burning impression on the minds of young people across the planet. The original DVD series was a smash hit, with Travis and his crew of outrageous buddies performing skilful but insane stunts on a range of contraptions. In 2009, Nitro Circus partnered up with MTV to create a smash hit new TV series, which aired in 60+ countries over 2 seasons and was one of MTV’s most popular series of all time. The series makes its return to MTV2 in October 2014. Learn more about the athletes/riders here.